The enticing bloom of a dangling flower, luring hummingbird and bee. 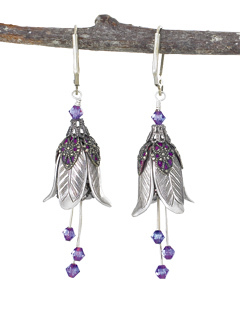 Leaves of fine filigree over purple enamel open to silver petals in full bloom. Silver stamens sparkle with lavender crystals for further allure. Latchback earhooks. Made in USA. Earrings are very nice. My Granddaughter may wear them with her wedding dress. Perfect Christmas gift for my wife. These are very lovely but they were too big for me unfortunately as I have very small ear lobes. Very fast delivery, lovely earrings. Love the catalog, well done! they're beautiful and don't hurt my ears like many other earrings do. They're light and I get many compliments on them. The quality and details on these earrings are beautiful. Both the wife and I were impressed.